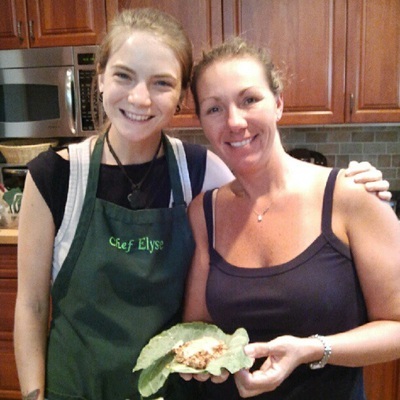 Long Island is blessed to be touched with Chef Elyse’s talent, humanism, and guidance! Her cooking classes are well-thought out, convenient ways to transform the kitchens and culinary skills of novices and connoisseurs alike. Offering a diverse menu of class topics, Chef Elyse serves up something for just about everyone. I particularly appreciate the multiple suggestions she highlights during each class so that each dish may accommodate multiple taste and allergy profiles, while infusing each chef’s personal touch. And the best is being able to go home and replicate the recipes in your own kitchen! It is one thing to “see it,” but the true test of Chef Elyse’s teaching craft occurs when you are home without any assistance: Chef Elyse, you always pass with flying colors! And I would be remiss if I did not mention Chef Elyse’s beautiful spirit. Her dedication as a chef extends to a commitment to charitable causes so that all, regardless of position, may be nourished. This is the ultimate assessment of her ability, and I am convinced that the love she shows and puts into her creations is the true “spice” that makes all of Chef Elyse’s creations tantalize one’s palate. May we all experience her unique flavor at least once so that we may share it with others. Thank you, Chef Elyse, for being you! Thank you for a wonderful class and for opening my mind to eating raw foods as a culinary adventure. I am hoping to move my daughter who is 11 years old, to open her mind and taste buds! See you at next weeks class! Thank you for sharing your gifts with us on Sunday! I thoroughly enjoyed the class. I am hoping to join you again this Sunday. “When my 11-year old daughter took one bight of your blueberry scone, she said ‘I want to be vegan right now'”! Loved the class on sunday! I will see you again this coming class for the nut cheeses. If you need a testimonial, here goes: Elyse has a unique sense of food combinations that will dazzle your palate, and you will be healthier for it. Thank you so much. My son and me, we loved the last two un cooking classes. We make the desserts all the time. The Pesto is the besto! You are a great chef and a wonderful teacher. Thank you Elyse! I love your classes. I always leave happy, enlightened, and inspired. Plus, you also have a positive energy and that is important when preparing food. Elyse has changed the way I look at (un)cooking! She taught me so much in so little time. The best thing I learned from her was not her delicious recipes, which I am very grateful for, but it is the base understanding of raw preparing which I can now use to experiment and create all sorts of new dishes!